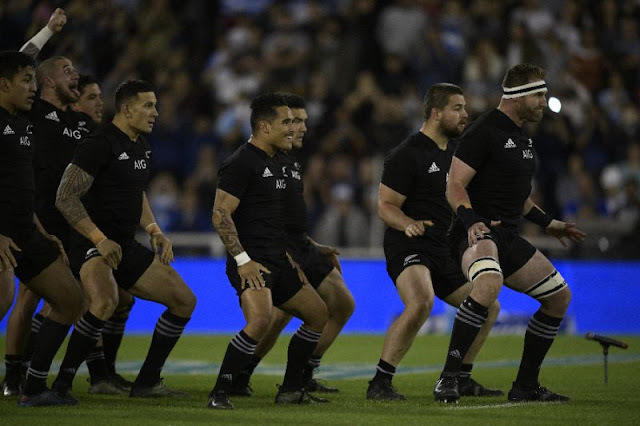 New Zealand All Blacks' players perform the Haka before the start of their Rugby Championship match against Argentina's Los Pumas, at the Jose Amalfitani stadium in Buenos Aires, on September 30, 2017. CAPE TOWN - Normal service has been restored to the All Blacks who will put their strongest available side on the park for Saturday's Rugby Championship dead rubber against South Africa. While Brodie Retallick has remained at home following a family tragedy, five other senior players were recalled after being rested when New Zealand played Argentina last week. New Zealand already have the championship wrapped up, but coach Steve Hansen said they were taking no chances against their arch enemy. Sam Whitelock returns to the second row, Liam Square and Sam Cane are back as the flankers, backline organiser Ryan Crotty will play at centre with Nehe Milner-Skudder on the right wing. The five were sidelined for last week's match in Buenos Aires to keep them fresh for the Springboks encounter at the end of a fortnight of arduous travel from New Zealand to Argentina and then to South Africa. Despite Springbok coach Allister Coetzee publicly writing off his side's chances, Hansen believes that behind the scenes they will be seething over their 57-0 humiliation when they played the All Blacks in New Zealand last month. "We know we'll be playing a proud Springbok side which will be determined to rectify what happened (in Auckland)," he said when naming his side on Thursday. "Our skill execution, our physicality and our ability to play our 'triple threat' game will be critical," he added, referring to the All Blacks plan to keep the opposition guessing whether they will run, pass or kick. Hansen is also concerned about the impact the travel over the past fortnight will have on their target of going through the Southern Hemisphere championship unbeaten. "Our preparation has been different because of the need to recover well from all the travel," he said. While the run on side is as expected, Hansen has sprung two surprises on the bench where Tawera Kerr-Barlow is the scrum-half replacement and David Havili, who made his Test debut against Argentina, provides utility cover. Damian McKenzie; Nehe Milner-Skudder, Ryan Crotty, Sonny Bill Williams, Rieko Ioane; Beauden Barrett, Aaron Smith; Kieran Read (capt), Sam Cane, Liam Squire; Scott Barrett, Sam Whitelock; Nepo Laulala, Dane Coles, Kane Hames. Replacements: Codie Taylor, Wyatt Crockett, Ofa Tu'ungafasi, Patrick Tuipulotu, Matt Todd, Tawera Kerr-Barlow, Lima Sopoaga, David Havili. Normal service has been restored to the All Blacks who will put their strongest available side on the park for Saturday's Rugby Championship dead rubber against South Africa.